Sign Crafters, Inc. is a full service sign company known throughout the United States including Jasper, Indiana for our quality products, outstanding customer service and affordable pricing. We have earned a reputation among signage companies as experts in the manufacturing and installation of a wide variety of signs. We carry a complete line of signs that include dimensional letters and LED signs and we also offer a variety of channel letter signs. Channel letters with colored acrylic facing, lit with an economical LED light source is our most popular option. Reverse lit channel letter signs are mounted so that the light within the channel creates a halo effect on the wall behind the letters. Different types of channel letter signs we manufacture hold a unique appeal and if you are looking for a 12” letter or a 12’ letter, we can create exactly what you need at a competitive price. Sign Crafters Channel Letter projects in the Jasper, Indiana area. 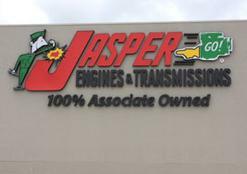 Our expert team is always available to answer your questions about our channel letter signs for your project, sign manufacturing or installation in Jasper. Click here to contact to learn more today!